So on Sunday I went to the voting station in Poalo to see if I could vote. After examining my cedula and seeing the rather recent date, they said, no, but I could get a certificate of voting. Now that is worth something as it is used in lots of ministerio applications. So now I have more documentation. Meanwhile just looking about the polling area, held at a school, was very interesting. Very low key and friendly. At the tables of each poll sat at least 2 persons, one with the master list of registered voters and the other handing out the voting sheets. These were so extremely different than in Canada. Here the sheet shows a photo of each candidate by position by party so in this case there would have been at least 25 images on the sheet. Beside each a place to make one's mark. Those who got a sheet, took it into a nearby room to make their marks and then folded it for the ballot box. The box was guarded by a local soldier, firearm at his side. And the party scrutineers were there to observe. Altogether just a few minutes. 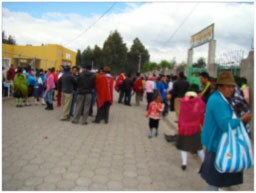 Outside the school and even in the school yard, there was a sense of community and festivity. Then we had to wait to see what might happen. 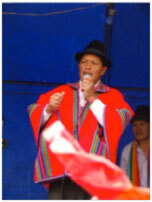 The answer is --- political life continues as Gonzalo is now elected the Mayor of the Canton of Poalo which includes the local village and the surrounding rural area. This is for a five year term so I shall be intrigued to see what evolves. All in all quite a fascinating and wonderful chance to see the countryside and to feel a part of something. And now I have more amazing pictures, a greater appreciation of life here and a whole new learning curve coming up.